bhubaneswar:31/8/18; Union Minister Dharamendra Pradhan Met with the members of Odisha Heads of Department Section Officers Association and Odisha Heads of Department Ministerial Officers Association at the Heads of Department (HoD) office at Bhubaneswar today. 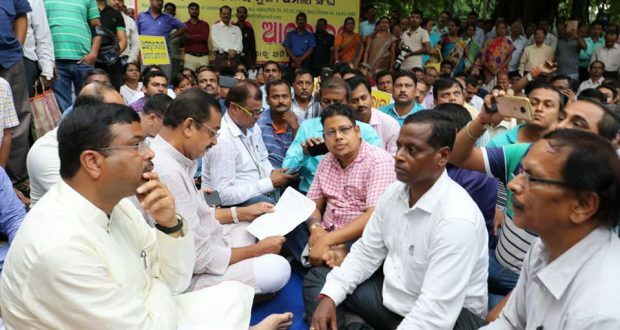 Demanding restructuring of their cadre, they have been on indefinite pen-down strike since August 17,2018. Pradhan hope and pray that the grievances of the members of Odisha Heads of Department Section Officers Association & Ministerial Officers Association are heard by the State Govt. and the impasse resolved without any delay. This is in the best interests of the people of Odisha and important for delivery of Good Governance in the state.